VJ Books presents Author Signed Bookplates! We have amassed thousands of author signed bookplates by hundreds of some of the most popular fiction authors. Bookplates have been a part of book collecting for hundreds of years. They were the earliest known marks of ownership of books, often bearing the name, motto, device, coat-of-arms, crest, badge, or any motif that related to the owner of the book. In recent years, bookplates have been used to offer the collector author signed plates to enhance the value and collectability of a volume. They are of particular interest when an author signature is difficult to obtain (like Stephen King or Dan Brown), or the author is deceased (like Donald Westlake or Michael Crichton). Sometimes these self-adhesive bookplates are "affixed" (stuck) to a page in a book, usually the first free endpaper. 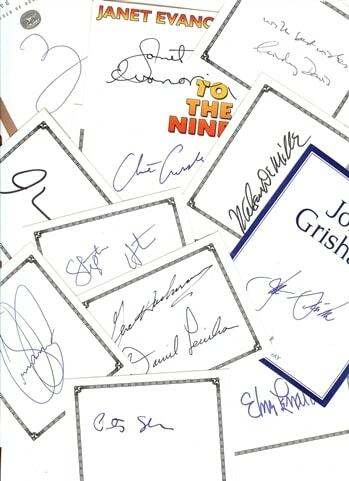 Growing in popularity, author signed bookplates are "laid-in" (loosely included) in the book. The laid-in process is preferred. If you later get the book signed by the author, you can then use the signed bookplate in a different book. In either event, an author signed bookplate increases the value of a book. Author Signed Bookplate. Self-adhesive label, approximately 3" x 4" (though sizes may vary slightly), signed by Peter Abrahams. Author Signed Bookplate. Self-adhesive label, approximately 3" x 4" (though sizes may vary slightly), signed by Will Adams. Author Signed Bookplate. Self-adhesive label, approximately 3" x 4" (though sizes may vary slightly), signed by Mark Alpert. Self-adhesive label, approximately 3" x 4" (though sizes may vary slightly), signed by Kevin J. Anderson and Lydia van Hoyt. Self-adhesive label, approximately 3" x 4" (though sizes may vary slightly), signed by Kevin J. Anderson. Author Signed Bookplate. Self-adhesive label, approximately 3" x 4" (though sizes may vary slightly), signed by Russell Andrews. Author Signed Bookplate. Self-adhesive label, approximately 3" x 4" (though sizes may vary slightly), signed by Kate Atkinson. Author Signed Bookplate. Self-adhesive label, approximately 3" x 4" (though sizes may vary slightly), signed by Sandi Ault. Author Signed Bookplate. Self-adhesive label, approximately 3" x 4" (though sizes may vary slightly), signed by Brunonia Barry. Author Signed Bookplate. Self-adhesive label, approximately 3" x 4" (though sizes may vary slightly), signed by Jefferson Bass. Author Signed Bookplate. Self-adhesive label, approximately 3" x 4" (though sizes may vary slightly), signed by Louis Bayard. Author Signed Bookplate. Self-adhesive label, approximately 3" x 4" (though sizes may vary slightly), signed by Josh Bazell. Author Signed Bookplate. Self-adhesive label, approximately 3" x 4" (though sizes may vary slightly), signed by Greg Bear. Author Signed Bookplate. Self-adhesive label, approximately 3" x 4" (though sizes may vary slightly), signed by James Scott Bell. Author Signed Bookplate. Self-adhesive label, approximately 3" x 4" (though sizes may vary slightly), signed by Ted Bell. Author Signed Bookplate. Self-adhesive label, approximately 3" x 4" (though sizes may vary slightly), signed by John Berendt. Author Signed Bookplate. Self-adhesive label, approximately 3" x 4" (though sizes may vary slightly), signed by James O. Born. Author Signed Bookplate. Self-adhesive label, approximately 3" x 4" (though sizes may vary slightly), signed by Ben Bova. Author Signed Bookplate. Self-adhesive label, approximately 3" x 4" (though sizes may vary slightly), signed by Gyles Brandreth. Author Signed Bookplate. Self-adhesive label, approximately 3" x 4" (though sizes may vary slightly), signed by Gene Brewer. Author Signed Bookplate. Self-adhesive label, approximately 3" x 4" (though sizes may vary slightly), signed by William Brodrick. Author Signed Bookplate. Self-adhesive label, approximately 3" x 4" (though sizes may vary slightly), signed by Dale Brown. Author Signed Bookplate. Self-adhesive label, approximately 3" x 4" (though sizes may vary slightly), signed by Ken Bruen.